The Lion God is not the Aye-Aye God. The Golden Tamarin God is not the Naked Mole Rat God. The Whale God is not the Blobfish God. The God who made the lion is not the God who made most of us. Only to be found wanting. Save by the wretched of the earth. But was He the son of the Lion God or the Blobfish God? His Father was certainly the Blobfish God. With the aye-ayes, the mole rats, the blobfishes, and the rest of us. They say God made us in His own image. So I say “Hasten to His altar”. The Lion God is the God of the flawless. By always imposing an intentional imperfection. In the act they were greatly pleasing in the eyes of the Blobfish God. The Blobfish God is an artist who knows flaws are the foundation of life. Something that looks ever more sublime the more it faces death. And retreats to the altar of the Blobfish God. And He is the Blobfish God. That the Lion God will save us. 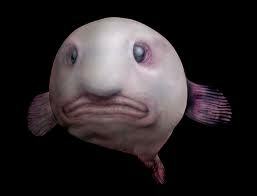 Then truly we look on the divine face of the Blobfish God.